How do you define marriage? The marital relation should be primary, which means that the marriage takes priority over all others human relationships. That means over our parents, over our work, over our friends, etc. Of course we are not to exclude them but our spouse's needs, hopes, dreams should be considered first over everyone's else (besides GOD OF COURSE). Marriage is designed to provide incomparable intimacy for the husband and the wife (and of course God as the center stone). The parental relation with our parents becomes secondary. Even in the union of marriage the children should be addressed after (and not before) the two parties becoming one. The institute of marriage is that the two shall become one flesh. Children are a result of marriage by choice, it is not the purpose of marriage but it is by choice and a fulfilling one I might add. It's we not me! Again it's no longer me, it's we! Two essential characteristics of marriage relation is UNITY and INTIMACY. Unity - it is no longer "I" but "WE." It is no longer "I" but "YOU AND I." LOVE, TRUST, FAITH & COMMITMENT. what's mine is ours and what's yours is ours. Marriage really shows how unselfish we really are. It'll reveal how giving we are or are not. Some joke around and say that only applies to one side but that is not how God views it at all. The two not only become one flesh but one in everything and also in every way. In fact when two souls are married, even in prayer, if both parties are not in agreement (in prayer), they cannot receive anything from God because God considers them to be one flesh and if they are not in agreement in prayer, that only spells confusion. God hears them but can't do anything. Often God will speak to the one or ones who are listening and tell them to talk to their spouse, settle their difference and come to an agreement, to love them the other the way they would want to be loved because if there is division in the communication, (the prayer) God can't answer the call because God honors covenant marriage, it's a commitment, a promise, a holy oath and it's very serious with God. God is for unity not division. This is one reason why God hates divorce. If both parties get married and do not share on an exclusive level, there is a issue of trust that needs to be addressed and dealt with. In most cases, prayer and fasting, forgiving past relationships and more may need to be addressed. Without trust, the relationship will not have a fulfilling end or reach it's highest potential . Both should seek God's help through prayer and fasting. However if only one person is saved, that person can periodically fast and pray for the other's behalf and both will benefit in time with consistency. Two are better than one, because they have a good [more satisfying] reward for their labor; For if they fall, the one will lift up his fellow. But woe to him who is alone when he falls and has not another to lift him up! Again, if two lie down together, then they have warmth; but how can one be warm alone? Two people are better off than one, for they can help each other succeed. If one person falls, the other can reach out and help. But someone who falls alone is in real trouble. Likewise, two people lying close together can keep each other warm. But how can one be warm alone? God's word is better than advice, it's foundation for the best life. Is it better that our partner be our friend also. "A friend (OUR PARTNER SHOULD BE CALLED ONE) is one who walks in when the rest of the world walks out." We can all learn how to really like someone when we find out how to make them laugh, however we can never really love someone until we find out what makes them cry and do our very best not to make them cry. Marriage just like every other relationship is all about communication which basically is formulating each persons feelings, desires, beliefs, expectations (within reason) and experiences (respectfully) to reach a common ground. Then to transmit that information (which should be valuable), process each others expression for clarity, verifying and observing, listening to our partner from our heart to relate with one another better. In some cases (if not most) our partner may only need to share something and may not want us to solve it. They may just need a shoulder to cry on, a hug, in short they want to connect and relate (share) with us. Hearing and listening are two different things. Hearing tells us the radio is on but we're not noticing (or tuned in) what's going on. Listening is tuning in, recognizing the tune, even turning it up (perhaps getting closer to them) so nothing is missed from their delivery, confirming the dialog, acknowledging the other completely. Encouraging one another is essential for a successful marriage. Put downs, over talking each other, impatient gestures, name calling that irritates your mate only places walls up for the relationship which can lead to separation in the future. ​We as Christian believers need to know that there is an enemy who is against marriage and hates this kind of unity as God originally designed and has a mission to separate the husband from the wife and the children from the parents. It's very serious and should never ever be taken lightly. If you are filled with the Holy Spirit with the evidence of praying in tongues (praying in the spirit) you should pray for your spouse daily in tongues. If you both are filled with the Holy Spirit and both pray in tongues, you should pray for each other daily in tongues and also declare/boldly speak blessings over and towards one another daily on purpose, even when you may not notice anything is going wrong. It's that important. The enemy doesn't take days off and neither should we. Meaning we should never let our guard down concerning marriage. Guard (or watch) your words, guard your thoughts and actions with careful attention. Prayer works when we are committed to pray daily and never quit. Consistency is key to success. Without consistency, we lose period. Both should desire for each other's very best to be reached at all times, especially when it's challenging. No one said it would be easy but it'll be worth it. It's not a competition (and never ever should be) because in God's eyes (and should be in both parties eyes) they (both husband and wife) are one flesh, one body, one in every way not two forces against each other but for one another. Couples should share with high regard to the other persons feelings doing all they can to encourage, help, pray with them (A HUGE PLUS) and practice the grace of empathy on all levels. Seeing things from our spouse's point of view and vice versa is vitally important or else it will not work. Everyone needs to feel loved and that they are valued. Proverbs 18:22 - whoso findeth a wife, findeth a good thing and obtaineth favour of the Lord. Hebrews 13:4 - Marriage is honorable in all and the bed undefiled: but whoremongers and adulterers God will judge. Genesis 2:24 - Therefore shall a man leave his father and his mother and shall cleave unto his wife and they shall be one flesh. Mark 10:9 - What therefore God hath joined together, let not man put asunder. It's never easy but with God as the cornerstone within the marriage it makes it all worthwhile and it makes all things possible. We can't judge a book by it's cover. Sadly some people marry only within a certain back ground. They are told, never marry a musician, a lawyer, or a trash man based on closed minded stereo types that only hinder peoples vision which also cripples their growth in relating to others. Also some only marry a person who has a certain amount of money but fail to realize money doesn't keep the marriage together, it helps but it doesn't guarantee success. Ultimately it is the two people (and God) and there core beliefs, working as a team that keeps it going. Don't get me wrong, everyone needs to work, have money coming in to live in this world but having more money does not secure that one will be better off. A person could be married to a multi-millionaire or a multi-billionaire who doesn't love them and treats them like a object, doesn't value their input and puts them down often and let's say they just stick it out. Well all they will gain from that relationship is a temporal satisfaction of having a great amount of substance at the expense of not being highly regarded as a person worth honoring, worth respecting, worth supporting and ultimately worth loving. Learn to value your spouse (and people in general) far, far above money. Money is needed in this world yet money cannot love you back, only God can personally love you and also God can love you through people. Money is a valuable and useful tool but people are invaluable, people are priceless in God's eye. God sent Jesus to save all people because we all are priceless to him and we must remember this. Even the hardest person to love is still loved by God and perhaps that person needs your daily prayers (in secret) so they will understand how truly blessed and loved they really are. In marriage both parties should aim to go the extra mile for each other in all that they do and not wait on the other to do their part but keep praying for their partner and thanking God that he is guiding them to be that person we so desire and need. Calling those things that be not as though they were. That's faith and faith is the ONLY way to please God. God uses people to bless others, to love others and pray for others. Always has and always will. It's something we must know and apply to memory. God doesn't change. He's perfect. He was right the first time. Marriage is so very important to God and it also must be very important to us as well. We hear it on the news and in the world today, someone gets married to another just based on their finances and (if) the money gets a bit lower than usual, their looking for another and that happens to men and women. All that proves is that they didn't love you but what you have they love which is very clear picture of what they most value in life. In some cases it's not their fault (completely) they could have been raised with a belief that money is everything. However everyone can change when they truly desire to change and prayer is the way to making that change a reality. It's nothing wrong with being wealthy. The truth is GOD is wealthy, GOD is the most wealthiest, successful, prosperous, faithful being in all existence (and so are his children hint, HINT). He's so wealthy He owns everything in existence, the universe and beyond because He created it all, so having wealth isn't wrong/evil HOWEVER to only look for someone who already has it together now is seriously limiting your options since marriage corner stone should be about love (GOD is LOVE). We could be passing up on someone God is working on who in time will solve a huge problem (or several small ones) that will radically change their financial situation and others and empower them to be a blessing to others, perhaps employing them or even greater than employing them, helping them to live their dreams so they can become entrepreneurs also. Ephesians 5:25 - Husbands love your wives even as Christ loved the church and gave himself for it. In other words it is quite possible to be with a decent godly person who is active in their prayer life and God could bless that person with a million dollar idea later in life. It depends on what they desire, what they know and who they know. If they know God, seek God first in all they do, follow his lead that's all they need to know because God can and will bring every other person to them needed for their successful life to blossom. It's always best to be led by God's unfailing love and wisdom than by the world's limited, imperfect knowledge and judgement. It's all about who you know and when we know God, trust God and follow his lead in all that we do, our bases are covered.....INDEED! However money isn't everything, some don't care how much someone has but are more interested with what you know and what you do with your time. Some only desire to love and be loved because that is what really completes them. Everyone is different (unique) which is a good thing (a God thing). We are all unique and we should all go for what you truly desire or what desires God placed in us, not what others want for us outside of the covenant marriage. Denying our wants that God placed in us, our hopes, our dreams to please only other people (outside of the covenant marriage) hopes and dreams means we're not being honest with ourselves and not truly loving ourselves either. Ultimately if we are not being honest with ourselves/loving ourselves, we'll have issues with being honest with others and loving others. We must open up and let go of negative people and circumstances believing for the best in our lives (and theirs) moving forward with God as the centerpiece of our lives. All things are possible when God is involved in our lives. We attract what we really believe and it will manifest when we maintain unshakable persistence, faith, using wisdom and trusting God for our success. Colossians 3:19 - Husbands, love your wives and be not bitter against them. 1 Peter 3:1 - Likewise, ye wives, be in subjection to your own husbands; that if any obey not the word, they also may without the word be won by the conversation of the wives. Marriage shouldn't be determined by what others say but by what God says. Imperfect people can't perfect each other. God is the only perfect being in existence that will and can lead us by the way we should go. So when in doubt, ask God. No one should be controlling the relationship either because that's not love. Even God (who is LOVE) doesn't control us but instead loves us, guides us yet always gives us free will and when we (by our own free will) choose to obey God we are blessed because we are his children. Our spouse should never be looked upon like our child, they are our partner, our better half, one who we are to love and not control. When we pray for our partner, we should always be thanking God for them to be the better half that becomes greater and greater every year. Call those things that be not as thought they were. Never complaining about what they haven't done but instead taking some quality time (each week) and thanking God for what they have done and by faith thanking God for leading them, for molding, for empowering them, inspiring them to mature them into the mate of our dreams. It's that important. Marriage is a lifelong relationship, ordained by God, marriage is also a gift from God and a sacred institution therefore those that have taken this path should go on and stay on a "Thank you God for my (husband/wife)" marathon so to speak and by faith really call those things that be not as though they were. Always thank God for what you desire and let God guide your partner to make the needed changes. Manipulation is never God's way of doing things. Never try to control your partner, only pray for them and lead by example. Pray for your partner daily and boldly thank God for leading your partner to be the very best they can be, reaching new heights every year in every way and becoming more in love with you (and vice versa) more and more each and every year. It's that important because if you don't, who will... Since you read this, (YES YOU) it's up to you to make the first move because it's clear that you want things to be better and better so, here's your opportunity. In short a Christian man should be within a union with a Christian woman. God created Adam and Eve to be one and they were. Since God is perfect and cannot lie, He cannot make mistakes, He is flawless in His work, the core of His being is 100% true, if He wanted it any other way He would have made it so. He did it right the first time and God doesn't make mistakes but instead it is we who will need his guidance. Attempting to fix something that was created by God and to quote "FIX IT" end quote (from an imperfect perspective, like all humanity) is very much out of order and just wrong. We also have to ask ourselves have we made Jesus just the savior of our life and not Lord of our life? When He (JESUS) is Lord over our life, for the Christian our response to God's call is, "Yes is the answer and what is the question." Being willing and obedient is what a Christian's lifestyle is all about and of course it's the most blessed and most fulfilling one also. He (GOD) gives the best rewards on earth and heaven and within a blessed marriage it's never perfect but I must say this, (my opinion) I can enjoy going to the movies, shows, shopping and such by myself but I enjoy even more with another person who cares for me unconditionally. That's priceless and worth the wait. Also think back what you did that made you and your mate fall in love. Start doing those things again and keep it up, meaning if you used to write them letters (not texting), get a few pieces of paper and a pen and go for it. Mail it with a stamp to her. Yes you both live together but they will never forget it and that's the point. Just take it one day at a time but also pray, speak blessing over each other each and every day. There is no cookie cutter way for making it work. 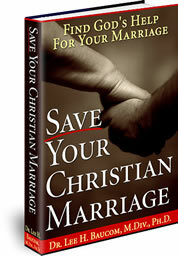 A christian marriage is hard work, it is a privilege and it is a commitment. A Christian marriage is a ministry. A Christian ministry follows Jesus' way of doing things, fish for people by loving on them the same way Jesus would have to help them have life more abundantly than they have received before. It's certainly not easy work but the rewards are priceless. It's being a disciple, unlearning and relearning to become a better disciple because no one is perfect to finally help by making disciples (and even helping them to become better disciples than ourselves). It's growing, it's giving and going forward by faith with God each and every single day. It's the same with Christian marriages. Both parties growing and going forward, trusting God, unlearning and relearning to become a better mate to each other each and every year. Use Your Child-like Faith And Start Getting Results! CLICK HERE to receive a FREE PDF to declare blessings over your spouse. CLICK HERE to receive a FREE PDF reading on EXPECTATION. CLICK HERE to receive a FREE PDF on praying over your finances. CLICK HERE to receive a FREE PDF on getting the desires of your heart through prayer. Darryl William Crawford is a Holy Spirit led, bible believer who enjoys helping people get closer to God, through the word of God with the Holy Spirit's help and by praying with authority in the name of Jesus. Darryl believes that no matter the problem we face in life, if God is not our source to our answers, we will always fall short from the truth. When God is our source, the truth can set us free. Want a very easy way to earn an extra income every time you send an email? Get your very own email signature, RIGHT HERE! You'll be glad you did! - Need More Information? Why Should We Pray In Tongues? Is Making Music Your Passion?